This is one of those series that seems to get better with each book. It’s so fun to return to this town with characters I already know and learn more about the glass shop. It’s a solid cozy mystery series with fun characters and side characters and a new exciting mystery with each book. And every book has a murder mystery and some glass topics mixed in as well. I like how the characters have an active role in helping solve the mysteries. Next to the mystery there are some side plot lines as well. The new studio Savannah opened and Amanda is now teaching her first class. This series is a lot of fun and I really enjoyed this latest installment. This book had a very different feel again than the others and I like how each mystery is very different again. One of the students for the up-cycling glass class Amanda is teaching is found death and there is some mystery surrounding his death and mysterious blue bottles that are linked to him. I liked the mystery and there are a few interesting twist related to it. We also get the detective his point of view a few times, which was a nice touch. The actual murderer wasn’t too big of a surprise to me, but I did enjoy the overall mystery and the story. The plot and build-up and progression surrounding the mystery was well done and kept my attention. I would’ve liked getting to know more about the murderer. In every book we see things change and develop with both Savannah the main character, her life and the glass shop. In this book she has opened a studio were students can rent space to work and Savannah should be running that while Amanda runs the shop. I liked seeing how Savannah expanded the shop and how we see the shop change this way. The new glass workshop was fun to read about too. We meet a few new side characters in this book as well. I also liked how Savannah was linked to the mystery as glass expert this time. They try to determine were the blue bottles come from and she also calls in some of her contacts. And there are some great returning side characters again like Edward, Amanda, Jacob and the twins. Who all play a role in the story. And some new side characters are introduced. There is a bit of development with the romance, but it still stays very much to the background, it just moves to the next stage. To summarize: this was a great third book in this series and with each book I am getting more invested in the series. It’s fun to return to the sunny town, the glass shop and familiar characters. There are new plot lines going on and a different mystery. Savannah is linked to the mystery as she gets called in as glass expert due to some mysterious blue bottles that are linked to the death person. It didn’t came as much of a surprise to me who the murderer was, but the mystery itself and the progress was done well and kept my attention. There are some twists earlier on which were fun and changed things up. All in all this was another great book in this series and I am already looking forward to the next book so I can return to Webb’s glass shop again. What’s the last third book in a series that you’ve read? Last week I completed The Demon Road trilogy by Derek Landy – a YA horror fantasy road adventure… Sadly I wasn’t all that happy at the way he chose to end the story. Oh that’s a shame you weren’t too happy about how the author ended the story. It’s too bad when that happens. This book wasn’t the last one in the series as far as I know, but it sure was a good third book. I’m terrible with series, and a rarely read past book one. I’m just as bad with cozy mysteries because I don’t even read them in order most of the time. 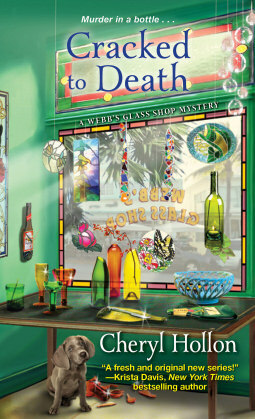 Cracked to Death sounds really interesting, even though I’m reluctant to read a cozy that takes place in Florida (my least favorite state!) I think I’ll keep an eye out for it at the library. Luckily most cozies series can be read out of order, although I still prefer to read them in order. There are a few series that I got from netgalley since the first book and I keep requesting later books if they get available as well. I hope you get the chance to give this series a try. It really is a good one. This sounds like a fun series. I usually tend to find myself getting bored by the third book but it sounds like this series gets better as the series goes. Yes this is definitely one of those series that gets better with each book and keeps going strong. This looks like a fun cozy. I’ve always enjoyed glassblowing and the idea of a glass shop is intriguing- and good side characters are always nice too. Cozies are kinda good too because if they have characters you like they usually grow a bit or their lives progress, and that’s always fun to follow. The glass shop is very fun and every mystery has something to do with glass in some way as well. And the group of characters in this one are fun to follow. I need to try a cozy mystery. I’m going to have to look for one with a good narrator and give it a try. I’ve seen a few cozies that are in audiobook, but not sure if the narrators are good. Do you follow Books, Movies, Reviews Oh My their blog? She reads a lot of cozies and audiobooks, she might be able to point you to a cozy with a good narrator. Yes, I do follow her. I know that Stormi does do a lot of cozies on audio. The Geeky Book Blogger does the same. I just need to look through them and find something I want to try. Okay, good to know you follow her. I hope you can find a good one to try! The last THIRD book in a series I read was probably Blue Lily, Lily Blue by Maggie Stiefvater. I have The Raven King- just need to find a good time to read it! As for your review, this sounds like a really good series. I love the theme that ties cozies together, like the glass shop in this one. I heard good things about Maggie Stiefvater her books! It’s fun how most cozies have a theme like this one. I like how the authors handles the glass theme here with the glass shop and most mysteries have something to do with glass as well. A glass shop owner mystery? I love how cozies just make the strangest things (to me) work! And this cover! I love this cover! I agree cozies often have unique themes like this :). It’s great this series has that mix of familiarity and freshness. I hope you give a cozy a try soon, I really like the genre and there are so many good ones out there. No problem! I haven’t been as active commenting as I would like either and hadn’t visited you for a while. I hope things return to normal for you now your kids are back in school. I totally just went and bought the entire series. I’m a sucker for cozies plus this one has a potential pirate link to it. The last third book in a series I read was Old Haunted, A Guesthouse Mystery, by EJ Copperman. Yay! I hope you’ll enjoy this series. I gave the first book 3 stars, but the second and third were solid 4 star reads. The potential pirate link was fun and I like how each mystery has something to do with glass as well. Great review! !This sounds like a great series and glad you are enjoying it. I don’t read a lot of series but the last third book was probably Cress from the Lunar Chronicles. The Lunar Chronicles is still on my wishlist. I love reading series, although a standalone now and then is nice too. You got my attention talking about this one. I don’t remember encountering this series before. I like what you are saying about it feeling like coming back to something recognizable and fun with the glass shop setting, the recurring characters, and the involvement in solving the mystery. Love that this one is tied to undersea treasure. Loves Sweet Revenge by Rosanne Bittner was my last third book in a series. It such a fun series, I managed to get all three of these through netgalley. It makes my day every time I see a new one there and get approved for it :). That’s something I like about series, being able to return to a setting and characters you already know. The undersea treasure tie in, in this one was fun! And I like how they get involved in the mysteries. Ooh, that’s such a pretty, brightly colored cover! I don’t recall seeing reviews for other books in this series, I feel like I would’ve remembered a glass shop since that sounds cool, but maybe not. The murder mystery was a bit predictable, but it’s still fun to see them figure it out and al sorts of things happen during the investigation. And it’s fun to return to a world you already known with familiar characters.